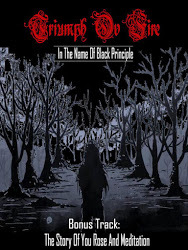 RANDOM: TRIUMPH OV FIRE "In The Name Of Black Principle"
TRIUMPH OV FIRE "In The Name Of Black Principle"
I finally managed to obtain this, as the name has somewhat been thrown around quite a bit, reasons of which I have no interest to plough into. Notoriously known as master of dissing controversies as I am, haha, let's delve into what they have to offer right away then. "In The Name Of Black Principle" is porously can be classified as melodic black Metal, and please emphasize the word 'MELODIC' in bold. They make full use of the keyboardist here, quite an important instrument for T.O.F to tell you the truth, it does create the atmospheres. And by listening to this I can fully understand why they're able to generate the crowd interest whenever they play live, their 'melodic-ness' is closely resembles those of Malay rock balladry, things that can only be understood if you live and breathe the local music scene of Malaysia. This will result in instant chemistry for the more open, on-the-fence type of listeners, thus the familiarity will become at ease. Catchy melodic-soaked black Metal with an unmistakable local rock flavour, will you accept that kind of tepid description? Ok then, maybe with a bit of tendency on the widely accepted modern melodic black Metal these days, DIMMU BORGIR et al. Colourful, plentiful Malaysian scene. KREMATION "Let Them Hate And Fear!!"